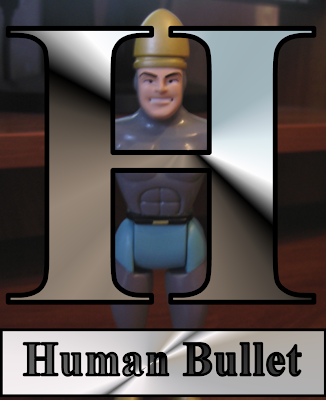 H is for Human Bullet. Sometimes it seems like certain heroes are good for one thing and one thing only. I mean...Aquaman. Seriously. Iceman makes...ice. He's great when you need a snow cone. You get the point. That's why I've always felt the Human Bullet is one of the greatest superhero parody characters of all time. I know it's a one-note gag, but it's a heckuva note. When danger lurks, the Human Bullet leaps into his cannon, and with the help of his son Fire Me Boy, he rockets into the sky to stop the threat. Of course, the Human Bullet usually slams into something inconsequential, but every once in a while he manages to help a little. I sure hope the Tick appreciates this guy's dedication to his job. And you have to feel for his poor wife. Tomorrow: It's killing him, but it's keeping him alive. He can be a bit of a teetotaler.